On November 28th, a dedicated group of activists gathered in front of the White House to bring attention to the ongoing crisis in eastern Congo. Organized by members of the Congolese diaspora community from D.C., Maryland, and Virginia, the rally was a public protest against the escalating conflict in Congo and a call on the U.S. government to take action against the worst aggressors of the conflict. The fighting has already displaced over 260,000 people within Congo, and an additional 70,000 have crossed into neighboring countries to escape the violence. Vulnerable civilians are now at even greater risk due to the restriction of humanitarian aid into many of the most affected areas. On November 20th the M23 rebel group took control of Goma, a key city in eastern Congo, in their most aggressive advance since April of this year. Matthias Cinyabuguma, a peace advocate from the Kivu region in eastern Congo, spoke about Congo’s long history of resource exploitation that has fueled conflict and bloodshed in the country since the advent of colonialism. Today, Congo’s vast resources are fueling yet another war, the deadliest since WWII. At the rally, Cinyabuguma called on the international community to "hear the voices of the Congolese people, who believe we are human beings, like everyone, and have the right to freedom and self-government." Participants marched around Lafayette Square, chanting that "Enough is enough" and "The time for peace in Congo is now". 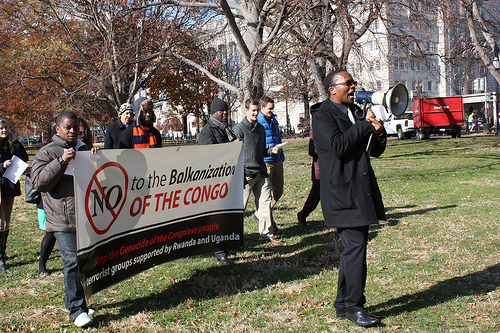 Protesters called on the Obama administration, Congress, and the American people to take action for Congo. "We aren’t going to rest until the people of Congo are at peace," said Cinyabuguma, "and the children can sleep at night without fear." TAKE ACTION: The U.S. government can help end the crisis. We need to encourage the White House to speak out against this rebellion. Send this letter Denis R. McDonough, the White House’s deputy national security advisor, and ask him to speak out against the M23 and for the people of eastern Congo.